Pocket Gamer Connects London is next month! Okay, there’s the small matter of Christmas and New Year celebrations between now and then, but the 21st and 22nd January will come around fast. And Thursday 13th December is even sooner. That might not be a date on your radar, but that’s when our Mid-Term prices end and tickets go up to full price. Book before midnight on the 13th to save up to $250. Now the biggest B2B event for the entire games industry in the UK, Pocket Gamer Connects is also the largest B2B expo and conference dedicated to mobile games in Europe. 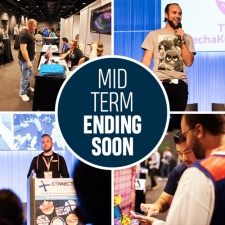 Book before the Mid-Term prices end next week to save up to $250! Pocket Gamer Connects London Early Bird prices end today!